We are so thrilled to have the first foal by Pevensey Regent arrive on the 16th of August. 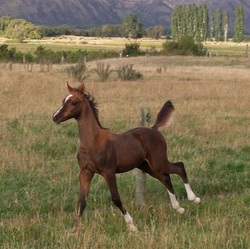 A chestnut colt, out of Sunny Brae Jasmine, Rajah is a substantial fellow with a beautiful calm temperament. July 2014: We are absolutely thrilled to announce the arrival of the pure Crabbet stallion Pevensey Regent from Australia. 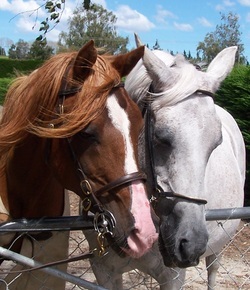 Jan 2014: Quasim leaves for his new life with Jo Forrester of Dunedin. 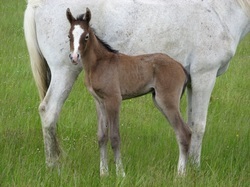 On the 24th of August this year Sunny Brae Jasmine presented us with another colt by Zibaq Khan. He is a strapping fellow and as a salute to his dam's pedigree I have decided to call him Qairo. Although he looks bay, he will in fact go gray. Thank you Lisa Simpson of Gore for sendng me these lovely pictures of Al Hadiye your gelding by Zibaq Khan and out of the late Dell Salila. Really enjoyed visiting Tracy Voyce and meeting her partbred filly by Zibaq Khan. Tracey is thrilled wth Ewa, who is ut of a palamino mare . Thank you to Petra Green of Canterbury for sending me some lovely pictures of herself and Zircon ( Quassa x Zhola) at Pony Club camp. According to Petra, Zircon is "the best Arab EVER". It has taken me some time to report the loss of two mares. February 2012 saw Zhola and Zellah pass away. 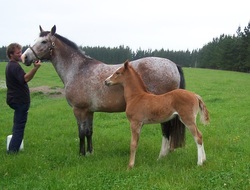 Zhola left behind her an orphan foal, Zhenya, a precious filly by Quassa. No words can can express the feeling of loss we have at losing these mares. 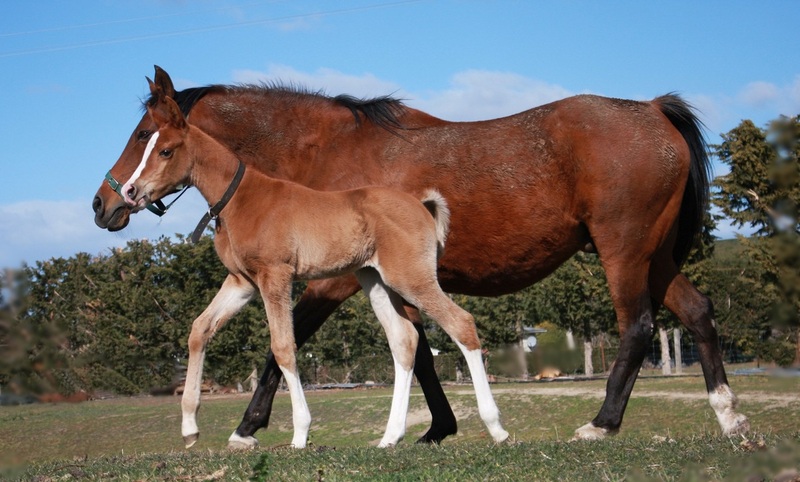 On the 18th of December the very last foal by Quassa arrived. A FILLY our beloved Zhola has produced a precious filly for us.We have yet to find a name befitting such a special girl. She is just beautiful and will stay bay. Congratulations to Tina and family on a fabulous filly by Zibaq Khan. 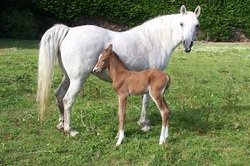 Blondini has produced a filly the very same colour as herself and that filly already has a devoted human attendant. We had the delight of viewing the very last part-bred foal to be sired by Quassa. 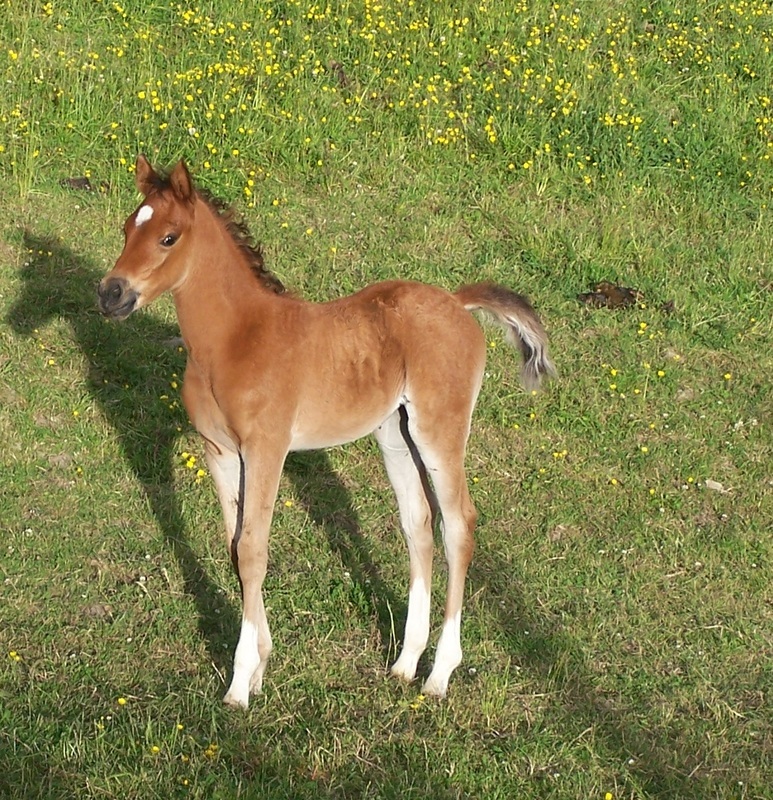 This foal is a stunning colt and was bred by Tania Deans of Hakataramea. Tania and her family are really enjoying having this fellow, tentatively named Max. Max's mother is doing a wonderful job of looking after him. Buffy is a firs time mother at 20 years of age! She is a quality mare by Dellmount Narduke and I think she has nicked very well with Quassa. Watch this space, if fate is kind, you will hear some more about this fellow. The grand old matriarch Dellmount Salila (Ralvon Luke imp AU x Silver Moonbeam imp AU) delivered a lovely colt foal by Zibaq Khan. Sadly, Salila died shortly after and the foal is now being reared by a foster mare. We wish Lisa Simpson all the best with her colt, yet to be named. The foals from outside mares are starting to arrive. 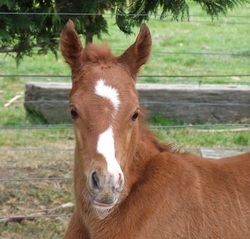 We congratulate Tracey Voyce of North Otago on the arrival of Twilight, a part-bred filly by Quassa out of Blaze. 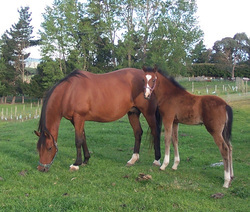 Also our friends Kylie and Rob Pape of Waikouaiti have been gifted with a purebred filly foal by Quassa and out of Dahmar Xavier. 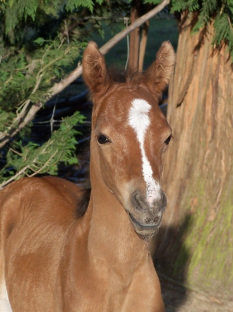 This filly is the second last Purebred foal by our dearly departed Quassa. Sunny Brae Jasmine has foaled a striking chestnut colt under a full moon on the 12th of October.Sired by our own Zibaq Khan. We have decided to call this colt Quasim, pronounced qazeem and is Arabic for distinguished individual. Quasim has a lovely kind nature and we are really enjoying having this fellow in our lives. it is with a sense of privilege that we announce that Sunny Brae Jasmine has been gifted to us. Although Jasmine was on lease and we were thrilled to have her with us, we are over whelmed by the generosity of her breeder Mary Brosnahan of Sunny Brae Stud, for choosing Lawrence Arabians as permanent custodians. 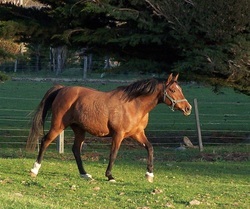 Sunny Brae Stud have been breeding quality horses for decades. 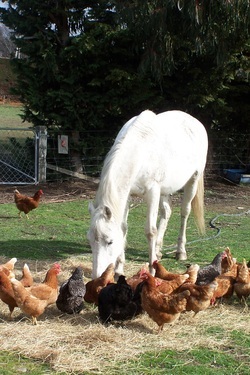 Purebred Arabians and partbred Arabians, Thoroughbreds, and Welsh Cobs and Welsh derivatives. 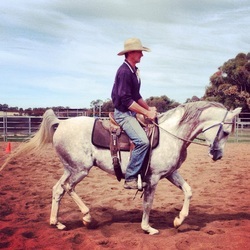 Anyone looking to purchase a performance horse or pony would be advised to check out Sunny Brae Stud. Contact me for information. It was with breaking hearts that we laid our wonderful Quassa to rest. He was one of the kindest horses that ever trod this earth. Quassa and Zhola, friends to the very end. Zircon leaves for his new home. We have bade a fond farewell to Zircon. He has been purchased by some lovely people from Canterbury and I am confident Zircon will get the opportunities he deserves with his new owner. Happy Trails, Zircon. We are very pleased to have leased for a season the lovely purebred mare SUNNY BRAE JASMINE from Mary Brosnahan of Sunny Brae Stud, South Canterbury. The last breeding mare of the Cairo exp Aust, son Czarak and out of Dellmount Jamil, a daughter of one of my favourite stallions, Touch Of Magic imp. We already have a Magic daughter, but we do not have the lines to Silver Sparkle imp UK/exp USA, or Nurmana. 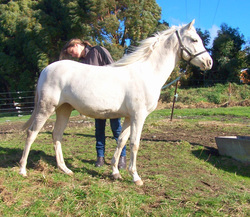 Jasmine has the look of a Touch Of Magic mare and the fact that she is bay and both her parents were grey, denotes the influence of Risheem, Magic's Irish bred sire, from whence the colour comes. We have decided to put Jasmine to Zibaq Khan, as we feel this cross will blend the strengths of both individuals. So everything is crossed for a healthy foal for next year. 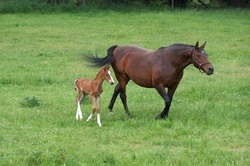 The 10/11 breeding season began when a grand old mare returned to us two weeks ago. Marina was last here in 2001. She was bred to Quassa and later foaled a grey colt . Her owners are so thrilled with their gelding that they have returned Marina to us. We feel honoured to have Marina back. She was an excellent endurance horse in her day and the blend of Dellmount Sudani , her sire and Quassa has been a wonderful cross. Fingers crossed for another great baby. Great news this week from Hastings. 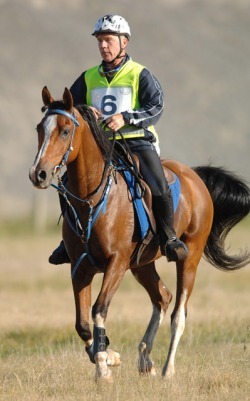 Alex Lothian and Zion(Quassa x Zhola) won the Open 90km Endurance ride at the New Zealand Horse Of The Year . This photo was taken by Kerry Marshall of Kampic. Thankyou Kerry for this fabulous pik. Great stuff Zion and Alex. 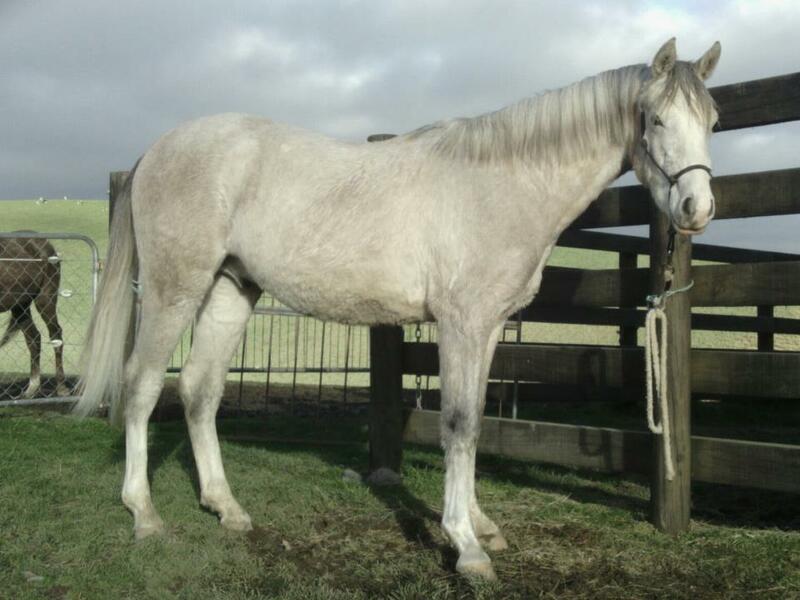 News from Dunedin this week that the beautiful purebred mare, Durdan Karen has been bought by a lovely young woman called Kerrie. Durdan Karen is by Quassa and out of the Crabbet mare Cymbal. We wish Kerrie many happy hours with Karen and thank Kerrie for sending us the delightful photos. One of which I have uploaded. 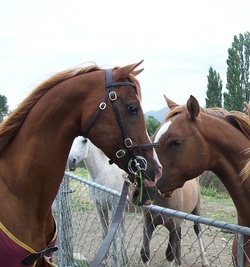 Karen was bred by the late Leo Oldham and it is Leo's daughter Kathleen who has bred the chestnut colt below. as Harry Chapin once wrote " All My life's A Circle". Congratulations to Jo Forrester on her latest success on Kadin a partbred gelding sired by Quassa and out of Jo's part Clydie mare Kizzy. Jo has done a wonderful job of educating Kadin, her very first foal. She and Kadin compete with success in CTR and Showjumping as well as Eventing. 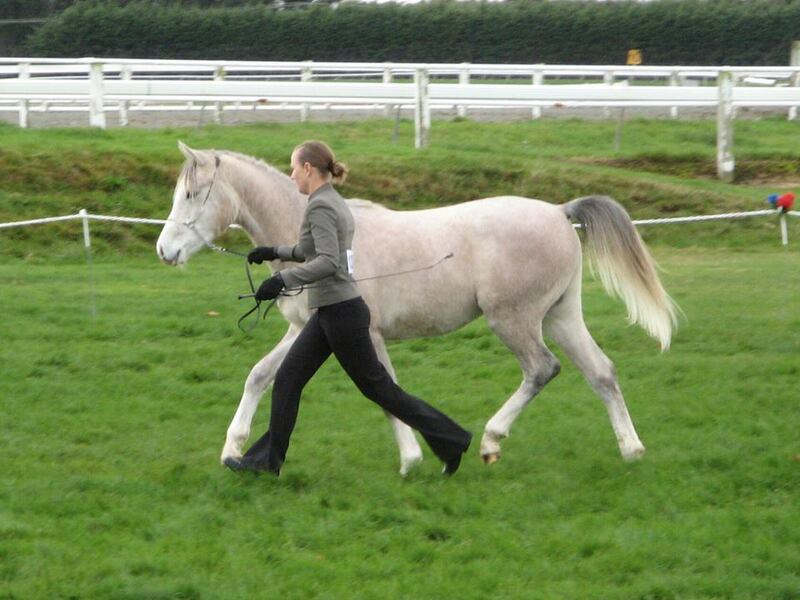 They are pictured above competing in Otago when they finished second in their section on their dressage score. We are very proud of what they have achieved. The photo was taken by up and coming photographer, Lisa Cross of Dunedin. 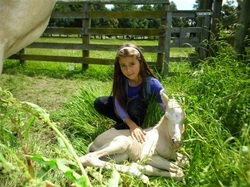 Our wondeful producer Zhola presented us with a strapping chestnut/grey colt on the 14th of August. We are thrilled with this chap. Now I have to find a Zee name for him.